No animation with this one, but I did include something new. Buildings before look a bit flat on top of the terrain. That's because they are missing shadows. I finally learned how to get the shadows on there properly, so that it renders out cleanly. I'm hopeful that including the shadows will help make the buildings look more "grounded." I think I'm preferring the version without the crates. Animations can be faked with this one simply enough. I'm curious though about coloration -- will the yellow pop well on the mars tileset? Maybe consider ditching the light posts, crates, and vats altogether and just make the bulldozer significantly bigger? While maybe more dimensionally correct this small, it is a bit hard to tell what it is because it is so small. I didn't think about that. It may be an issue since the new tile set is a bit more brown and yellow, vice orange-ish. Here are a couple more variants. To include two 50% larger dozer versions. Woot! Going to add that to the game pretty much right now. As I mentioned in IRC, having larger variants, say 128x128 would be awesome for the proposed UI changes. And the miner. I think maybe I accidentally double-scaled the digger and miner. Let me know if they are too big. I will also fix the "dirt" part of the digger and miner (so that it works on non-mars type planets also), once the design is agreed upon. I like the bigger dozer. Those vehicles are pretty cool looking. I can even see what they're supposed to do now. I really love the idea of the Digger and Miner robots showing something on the surface besides just changing the tile to dozed. Looking forward to adding those in as well. 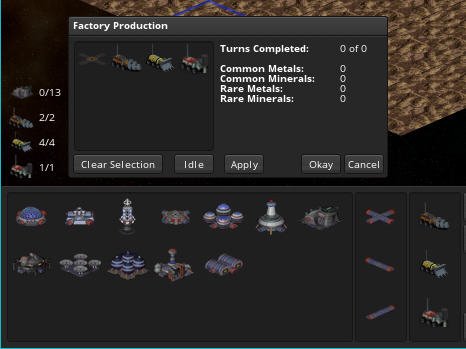 Still really want to get the 128x128 versions of the icons for the factory UI. Oh dear. I might have to add real details then. Here's what the digger looks like at 128x128. If you want something like these, then I will need to clean it up slightly (such as the wheels getting cut off at the bottom). I never would have seen that. You almost got away with it! I like the vehicles. Especially like the different colorations for each. Personally, I like having the lights and the other elements in with the vehicle. Makes it look like a construction site. Even though they don't permanently reside on a tile, the additional elements still make the realism aspect of the site look really nice. I like Robot Command 04A better. Lines look crisper and, at least to me, the shadows seem to pop more. 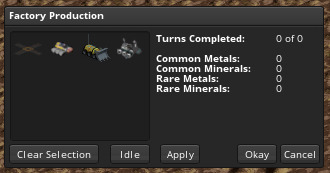 I realized after the fact that one of the vehicles had the wrong materials on it. I've fixed that one, then undid some camera angles. Here's another set that matches the above, except with the "proper" camera angle (as compared to every other building/vehicle/etc). The camera in these is a bit more "flat" than the one used for the above icons. The last variants look the best to me. I'll include these in the game when I get home.